The Thailand Ambassador was Hitler's Last Visitor? Re: The Thailand Ambassador was Hitler's Last Visitor? Are these books available in English? Perhaps he mentions meeting Hitler in his Russian prison memoir? How important is Maj General Phra PrasartPhitthayayut (Wan Choothin)? Is he still a well known historical figure in Thai history? I'm really curious about him. He's really interesting. I appreciate any information you can provide us with. Balrog wrote: Thank you, Wisarut. Are these books available in English? - Perhaps he mentions meeting Hitler in his Russian prison memoir? NO - ONLY in Thai as it is a part of crematorium tome for his passing wife. Is Maj General Phra PrasartPhitthayayut well known in Thailand today? Is he remembered in Thailand as a hero or a villain? 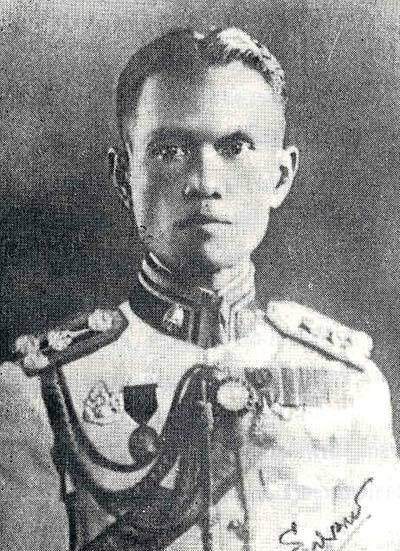 Balrog wrote: Is Maj General Phra PrasartPhitthayayut well known in Thailand today? Is he remembered in Thailand as a hero or a villain? For the case of Maj General Phra PrasartPhitthayayut, he is just another political victim just like fellow Four Musketeers. 1. Colonel Phraya Songsuradej (Deva Bandhumasena) - a fellow Siamese army men who graduated from Prussian Military Academy or (Hauptkadettenanstalt) in the town of Lichterfelde, near Berlin, Germany and the REAL brain behind Army faction of People Party. Colonel Phraya Songsuradej was forced to live in exile in Jan 1939 in Saigon before moving to Phnom Penn after the purge due to the friction with the Leader before being succumbled by mysterious disease after his disciple has given some food in 1944 and his disciple (Captain) who followed Colonel Phraya Songsuradej to Phnom Penn was the one who recorded all about the later life of Colonel Phraya Songsuradej until he died. 2. General Phraya Phahonphonphayuhasena (Phot Phahonyothin - a Statesman after his retirement from Prime Minister in November 1938) another fellow Siamese army men who graduated from Prussian Military Academy or (Hauptkadettenanstalt) in the town of Lichterfelde, near Berlin, Germany. General Phraya Phahonphonphayuhasena had lamented to his fellow Army while he has been evacuated to Bang Pa In after the bomb raid in Bangkok in 1944 that the warning from the fellow Army men who have been purged by 1932 Revolution has become a reality - Once those younger Army men and Civilian bureaucrats have gained power after clinging with him during premiership, they will eventually abandon him by kicking upstairs to become powerless statesman. It's great to see how much information has been posted since I made this post. I haven't looked back for awhile and I'm really amazed. I asked the New York Public library about this and they wrote back, "In this case, since the topic in question is simply beyond the scope of the expertise of this reference service, please feel free to contact the National Library of Thailand." They did reference this post in the Axis History Forum, however. Thanks for all the help. I guess we still don't know what took place and whether the Thailand representative and the Furor shared some Somtam (papaya salad). I plan to write up a blog post with this new information. It's not exactly a hot topic of conversation here in the Land of Smiles, but I find it fascinating. Now, the last chater about Maj Gen Pra Prasartphitthayayut (Wan Choothin) has been issued - After 7 months and a half in a POW Prison in Moscow, he has been released back to Thailand in 1946, Pra Prasartphitthayayut (Wan Choothin) has been visited by Gen Phraya Phahon (Statesman) who was suffering from stroke to become handcapped. Later on around 1948, Pra Prasartphitthayayut (Wan Choothin) has worked as Director of Postal and Telegraph Dept and the Leader has come to see Pra Prasartphitthayayut (Wan Choothin) when the Leader was become PM once again. During the conversation with the leader, Pra Prasartphitthayayut (Wan Choothin) has warned the leader about the way to nurture Democracy which the leader has accepted. Due to the suffering from the frigid prison in Moscow, Maj Gen Pra Prasartphitthayayut (Wan Choothin) had to learn how to turn fruit into booze for himself, causing the liver diseases that killed him on 4 December 1949, ending the colorful life for good. This has been an extremely interesting thread. Where did the Thai Ambassador fall into soviet captivity? Berlin? You can see that just before 20th of April 1945, Yong Pholabun from Kingdom of Thailand embassy visited AH. Sea captain - Y. Taniguchi ?